Last week we published a blog clarifying that, no, the Spokane City Council is not looking at bumping the current $9.47 minimum wage up to $15 an hour. It's important to look at that in context. A website called Smartasset recently looked at the 141 largest cities in the United States, examined their minimum wage, and then adjusted it for cost of living. In other words, if you're being paid $9.47 an hour, how much does that $9.47 actually get you? Smartasset dubbed it the "Real Minimum Wage." 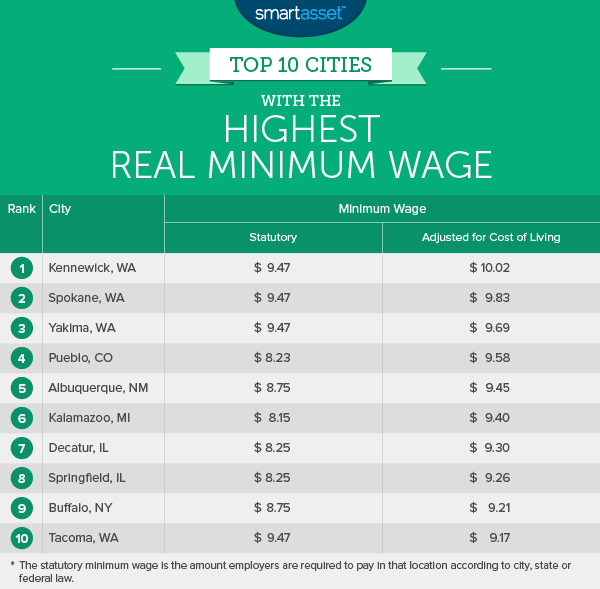 And of all those cities, the Real Minimum Wage in Spokane is the second highest in the country, just behind Kennewick. Working a full 40 hours, every single week, that would be $19,697.60 per year. If you took two weeks of unpaid vacation, that's $18,940 a year. I live in a one-bedroom apartment in Browne's Addition. The bathroom and kitchen are a little small, but as far as location, it's absolutely perfect. Nearly everything I need is in easy biking distance. It only costs me $450 a month, electrical bill not included. That's $5,400 a year. For the purposes of argument, assume she were a minimum-wage employee. At the state minimum wage, working a full time job, she'd be spending nearly two-thirds of her income on housing. Even with Seattle's current minimum wage of $11-an-hour for most businesses, she'd be spending half of her salary on rent. In fact, even with a $15-an-hour minimum wage, she'd still be spending more than a third of her income on rent. After all, by at least one cost-of-living calculator, a minimum wage salary in Spokane is equivalent to a $13.22 per hour salary in Seattle. By contrast, it's fairly easy to get by on a comparatively small salary in Spokane. My sister and brother-in-law are raising two kids on a single-earner second-year-teacher income (plus tiny stipends from my brother-in-law's middle-school coaching and running club.) They recently bought a house in Indian Trail, and they're still under that 30 percent housing-costs threshold. They have to budget carefully and scrimp costs. But they still have enough left over to pay for Netflix. There's a downside, of course, to living in a low cost-of-living place like Spokane. Spokane County's median household income is $49,233. King County's median household income is $71,811. As a city, that lower median income makes it harder for the community to attract investment or to get a top tier bond rating. And it means that if you want a higher salary, you may need to move to Seattle. Just don't expect your money to be worth as much there.